Do Phytoceramides work? Do they have any side effects? Will you look younger? 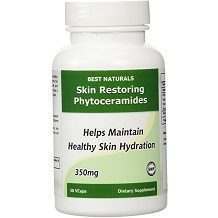 To answer those questions, continue reading our Best Naturals Skin Restoring Phytoceramides review where we’ll give you all the necessary pieces of information so you’ll be able to decide for yourself. This dietary supplement claims to play an important role in keeping your skin looking healthy as it offers many kinds of skin benefits. This includes eliminating the appearance of lines, wrinkles and “crow’s” feet. It also claims to improve the skin’s firmness and appearance and protects it from future signs of aging. According to the product’s own label, this dietary supplement should be taken once a day preferably with food or as directed by your health care professional. 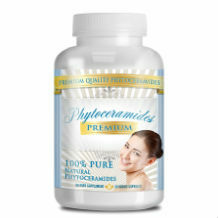 The product seems to contain the appropriate amount of phytoceramides which is 350 mg. However, vitamin C falls somehow short of the current daily recommended intake. The ingredients used in this dietary supplement seems to have little to no side effects and are considered to be relatively safe as long as the proper dosage is followed. This product is only recommended for adults. If you are pregnant, nursing, taking medications or have any medical conditions, consult your doctor before taking this product. This product is available for an online purchase from the manufacturer’s website for $22.74 (excluding shipping fees) per bottle containing 30 capsules. The product’s website offers free shipping on purchases greater than $25. There are currently no trial options and discounts available for this product. If you are not satisfied with your purchase, you can return the product within 30 days to get a refund minus the shipping charges. However, the manufacturer seems to only accept unopened and sealed bottles which is bad news for those who want to try the product risk-free. In summary, the product seems to contain ingredients that offer some promising benefits to reduce skin damage and make it look healthier in the process. It’s also a good thing that the product doesn’t contain any ingredients that may cause serious adverse effects. However, potential first-time buyers might hesitate when it comes to buying this product as the manufacturer only accepts unopened bottles for returns. This policy makes it very hard to test the product to see if really works. Furthermore, the product also seems to contain a lower amount of vitamin C compared to the current recommended daily allowance.